A group of approximately 20 students demonstrated outside Geisel Library this morning for various social and economic issues as part of a coordinated effort across all the UC campuses to gain the attention of the university chancellors before their collective meeting tomorrow. Led by the UC Labor Commission but representing a conglomerate of student organizations, the protestors marched in a circle near the Silent Tree before moving down Library Walk to deliver a list of demands to Chancellor Pradeep Khosla’s Administration Building. According to a document handed out to observers of the demonstration, the students are making seven demands of the UC chancellors: (1) offering retirements, livable wages, and stable benefits to all UC workers, (2) ending subcontracting practices in which the UC system outsources jobs to third-party entities, (3) eliminating all ties that are not legally mandated with federal immigration agencies, (4) divesting from companies that are “complicit in the violation of Palestinian human rights,” (5) banning police presence from all forms of campus protest, (6) requiring academic freedom for librarians, and (7) meeting the demands of all UC labor unions currently in negotiations with the administration. UC Labor Commission member Azriel Almera summarized the demands, to which the group is requesting a public response by Jan. 15, and emphasized to the UCSD Guardian that the demonstration is intended to motivate the UC chancellors to address them. “Tomorrow all the chancellors of the UCs are going to meet, so the point of this rally is also to drop off the letter of demands to our chancellor, to Chancellor Khosla, so that the s— that’s going on is brought up to the chancellors’ meeting,” Almera said. Almera also expressed that they expect their tactics to be effective as they are being carried out system-wide. The circular march outside Geisel Library, as well as the procession to Khosla’s office, also included a continuous stream of mostly call-and-response chants led by former A.S. Senator Miguel Angel Tapia. “What do we want? Justice. When do we want it? Now,” alternated with “no justice? No peace. No contract? No peace,” “If we don’t get it? Shut it down,” and other phrases. Unable to directly hand their demands to Khosla, the protesters delivered the letter to an advisor for the Executive Vice Chancellor for him to pass along. 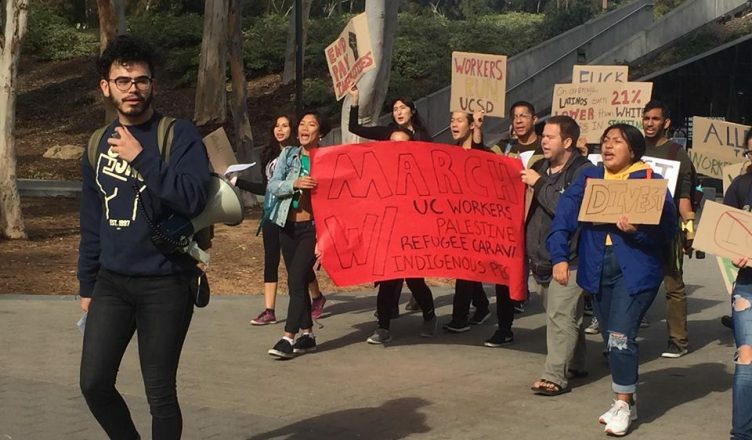 In addition to the UC Labor Commission, Kaibigang Pilipina/o, the Black Student Union, the Student Sustainability Collective, and the Asian and Pacific Islander Student Alliance participated in the protest. The group is expected to follow up with its demands after the UC Board of Regents meeting in January.